Tragedy is something we don’t ask for, but doing our best to make some good out of it is the least we can do. Sebastian Montero lost his life just two months ago and seeing the amazing outpouring of love brought a living face to someone I’ll never meet. So many unrealized hopes and dreams were evident from the connections displayed by his family and friends that his loss will live on with this complete stranger. It’s easy to let go and move on with our regular lives, but I’m proud that his support system keeps this loss in the forefront. In the same month as his death, a fundraiser was held in conjunction with LAPD and now the momentum continues. 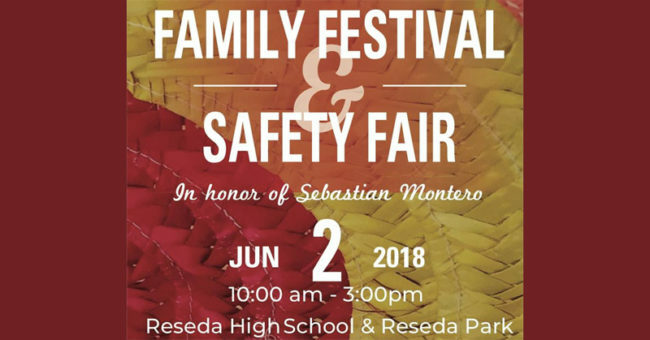 This Saturday, Reseda High (my school’s rival back in the day) is hosting a Family Festival and Safety Fair on campus in honor of Sebastian. The fact that such an event has been organized should be lauded. We do not do enough to promote street safety, so everything that can be done to raise awareness is desperately needed. There will also be fun and games for the whole family including music and dance performances that will no doubt feature friends of Sebastian. Please spread the word and support this fair on Saturday from 10am – 3pm (Facebook info here).